When done well, SEO, search engine optimization, can be one of the biggest influencing factors to generating traffic for your website. 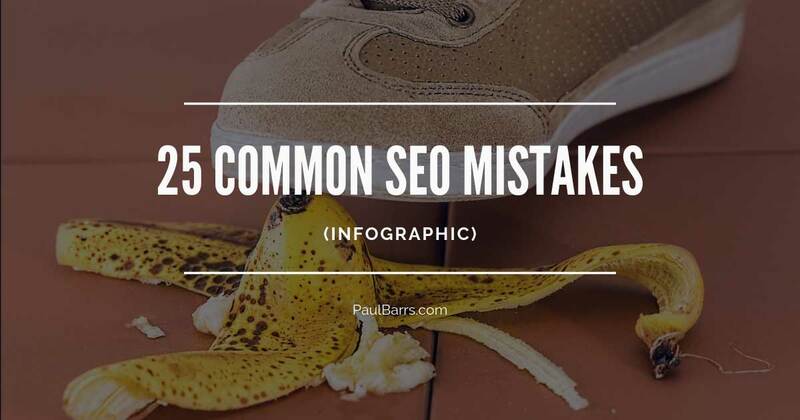 Today we’re having a look at 25 common SEO mistakes – a short paragraph for each that you can read in just minutes. Number one, sluggish page speed. Oh, this is so important. Google says that we need to have our, at least homepage, loading within three seconds. If you go to gtmetrix.com, you can test your own page speed and find out what you need to do to improve it. Number two, poorly designed landing page. Look at your Google Analytics to find out which pages people are actually landing on. Not just the homepage, but your top 10 pages, and look at how you can improve for conversions and usability that UX. That all your customers wants to know how easy it is to get through your site. Number three, not optimized for mobile. This is incredibly important, especially here in Australia. With the number of users and mobile use now in some industries overtaking desktop, we must have our websites optimized for mobile. Four, too much clutter above the fold. This is an old newspaper term, it refers to what people see before they start scrolling down. It’s above the fold of the newspaper. What they should see is a clear concise message—what you do and who you do it for. Make sure that’s all they can see above the fold, with links then to dig them deeper into the site. Number five, not having a site map. The site map is incredibly important for two reasons. One, it helps customers find what they’re looking for, for the more sort of less used pages on your site. But you also need an XML sitemap, which is submitted to the search engines so they can crawl all pages. Number six, not testing with compatibility on different browsers. Hey, whatever browser you use, that’s your favorite, right? But there are at least half a dozen commonly used browsers. You should test all the major ones, and perhaps check your analytics to find out which ones your customers are using. Number seven, not optimizing for local search. So important, local search. Getting found in your local area. You can not only optimize your website, but also your Google local business profile for best results. Number eight, having zero presence in social media. This is a dead set killer. 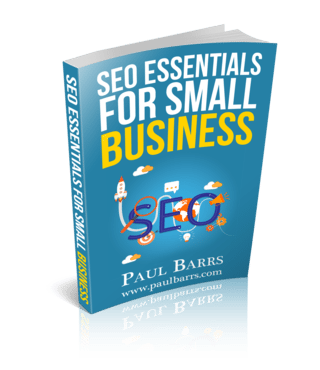 And yes, it affects overall a small factor in regard to SEO. Google wants to know not only are you popular on your site, but are you popular elsewhere? It’s part of the whole process with getting found online. And if your customers love it, they’re going to want to be able to find you as well. Number nine, not having a clear call to action. Now, this is important not just on every single page, but especially important on your homepage. Like I mentioned earlier, who is your product for? How can people find out more? Having a call to action on your pages, listen carefully, below the fold, is important for SEO. Above the fold they should find out what you do and who you do it for. Then they scroll further down or click through deeper to your site and find your call to action, your products, and your services. Number 10, not updating old content. Either update it or delete it. Maybe put it into draft, if you have to, before you get around updating it. But this is something you should do on a regular basis. Every sort of 6 to 10 months go through and look, where is your old content? Is any of it now irrelevant? Or if it’s evergreen, can you at least update it? Number 11, writing content that is not benefit focused. Don’t waste your customers’ time. Just like I’m doing here, get straight to the point. Show them what they want to see, not what you think they need to see. Number 12, having an ineffective outreach strategy. This is crucially important not just for link outreach, but getting out there. Getting your name out there, building relevance across the web in all areas. Not just your website, not just social media, but other people’s websites as well. Number 13, inconsistent content publishing. Create for yourself a content schedule. Monthly is better than six monthly. Monthly is better than three now and five never. Find out weekly or fortnightly or whenever, and be consistent. Number 14, not promoting your content effectively. You have to promote your content. You can’t just put it up, you’ve got to get it out there. So share it on social, send it out to your newsletter subscribers. I even use remarketing to get past visitors back to look at new content. Fifteen, not using alt tags for images. This has always been around with SEO. When you hover over an image, a small box of text comes up. It’s important, but it’s also important technically, and more important these days for those who are unable to see correctly and use different browsers which tell them what’s on the page. Use the alt tags to describe not just the keyword you’re targeting, but what the image actually is. And hey, if that image isn’t related to the page, why is it there in the first place? Number 16, using uninteresting headlines. Oh, boring, boring, boring. Don’t do that. Make them short, make them sharp, make them catchy. Number 17, not creating engaging content. This is just as bad, boring, blah, blah, blah. Why would you do that? Customers are looking for you for one of two reasons. One is to buy a product, or two is to decide whether it’s the right product to buy in the first place. Your content must be engaging. Number 18, using boring and irrelevant images. As mentioned before, the images on your page must be relevant to the content on the page. The content, of course, relevant to the user inquiry, the user search, what Google calls user intent. Ask yourself this, “What is the intent behind my visitors’ search? Why are they coming to my website?” And make sure everything is targeted to that. Number 19, unoptimize sharing images and social sharing. Set up your social metadata so that when people share your content, the images that are shared are optimized. And of course, optimize them on the web as well. Crucially important for page loading and for shared content to get people back to your site. Number 20, and I hate this one. This is one of my pet ug-hated, keyword stuffing. Having so many keywords, “I’m targeting this keyword, you better write about this keyword,” blah, blah. It’s a horrible way to do business. It makes you look like a fool when someone’s reading your content and the search engines really don’t like it. Number 21, lack of proper internal linking. It’s incredibly important to have a good strong internal link structure. Not just for SEO to help the robots crawl from page to page, but also more importantly, for your customers, to help them find what they’re looking for and find it fast. Number 22, this will destroy your SEO, is by not replacing broken links. You must replace broken links. You must look for the errors, the 404s, and correct them as soon as you find them. Number 23, ineffective keyword research. Yet again, you must do your research to what your customers want. Looking to understand the user, the searcher’s intent, and target your keywords, structure your site appropriately. Number 24, failing to track and analyze the results. I don’t know why people do this. What a waste. You’ve got to use your analytics to understand what’s happening on your site, what pages people arrive on, when they leave, and how long they spent in between. That way you can find out what works and what doesn’t. Number 25, not linking out to quality sites. Now, this is a new one from the past few years. Once upon a time, we only wanted people to link in. But no, if you’ve got authority sites out there, it’s useful to your customers to link to that authority site. Notice, not your competition, but it’s useful to the customer, then yes, court the authority site and link to it. That is part of the SEO ranking mix. And lastly, one bonus, 26, ineffect use of 301 redirects. And this is important, it’s a simple thing where maybe the http://www redirects correctly to the https://www. So your non-secure website redirects correctly to the SSL secure website. It’s a technical thing. Ask your web designer if you’re not sure. Or, of course, if you’d like some help, contact us, give us a call. Talk to me and I will help you get the answers to these questions and get found in Google and found in search. Have a great day. Talk soon. Bye, bye.